Why did the present pope taken the name, Francis? Don’t get me wrong. I was thrilled when he made that choice upon his election. St. Francis (13th century) lived out great values, of special interest to anyone in the modern Green movement. A few facts. St. Francis (13th century) lived out great values. He left Italy and crossed the sea to visit the Sultan in Egypt. The Sultan was the top Muslim official in the world. Francis’ goal was admirable: to get an agreement that would stop the fighting between Christian and Muslim armies during the crusades. He failed to reach his goal, but he tried. Will the current Francis, the pope, make a similar journey and plea? Saint Francis before the Sultan. Giotto. In the public domain. Source: Wikipedia. 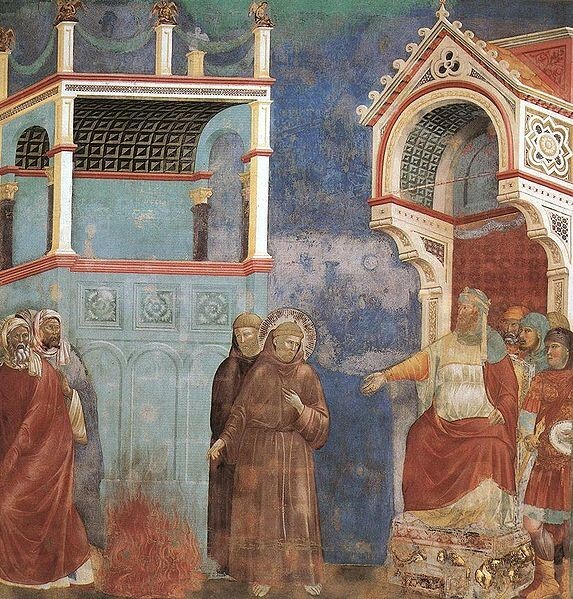 Old St. Francis reached out to beggars, laborers and people of every other social class. And animals. Do you have a pet? St. Francis befriended birds—he’s often depicted with a song bird on his shoulder. And other animals. It’s said that he knelt before a raging lion to pull a thorn from its paw. “Well,” said Saint Francis, lighting up like clouds in the sunset, “I get the meaning of liber. It has something to do with freeing, or freedom. “Yes. A way of thinking that promotes a life of acting for justice and liberty,” said Pope Francis.